FOI, the Swedish Defence Research Agency – subordinated to the Ministry of Defence of “Neutral” Sweden, is now reported of helping in complete secrecy - totally behind the Swedish public and Parliament (according to declarations of Vänster Party's chairman Jonas Sjöstedt) – the building of a missile factory on behalf of the notorious dictatorship in Saudi Arabia. The breaking news emerges just few days after FOA ungrounded accused WikiLeaks founder and editor Julian Assange of illegal actions against Sweden. Professors blogg asks, FOA, Who is in fact violating the Swedish laws? "I cannot totally confirm the picture as given by the media today". Tolgfors has the supreme institutional command over FOI (the Swedish Defence Research Agency) agency which - as known in the latest news - established a fake company in order to implement the secret agreements with Saudi Arabia; The name of the company is Swedish Security Technology and Innovation, SSTI. In this way FOI thought the operation it could not be traced by the Swedish Parliament. 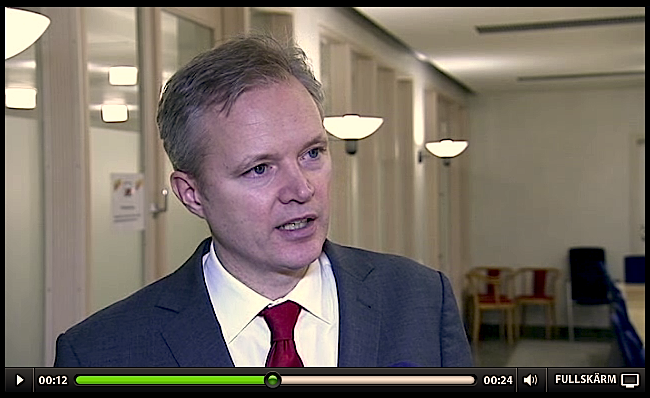 Namely, "none of the committees of the Swedish Parliament was never informed och such operation", said the Vänster Party's chairman Jonas Sjöstedt in the SvT evening-news 6 March (see also statement of the Vänster Party). On the other hand, as Dagens Nyheter informs 7 March, the said fake company "Swedish Defence Research Agency" given the same address and telephone number as the Swedish Defence Research Agency". It is highest unlikely that the Intelligence services at disposal of Defence would not have alerted Tolgfors of the upcoming disclosure. 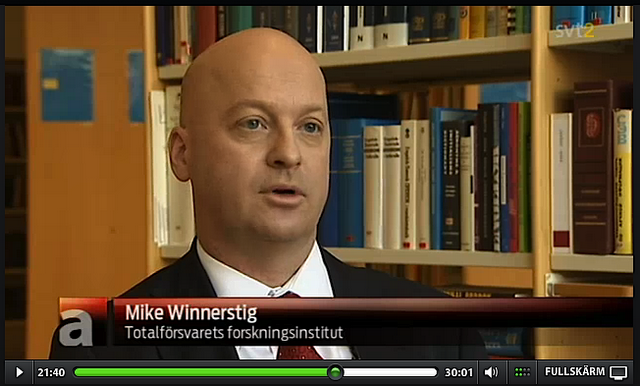 In this scenario, it is likely that Tolgfors' subordinate, FOI's Vice Research Director Mike Winnerstig (below) had the assignment of sending a chauvinistic smoke courting to the public, by spuriously accusing Assange and WikiLeaks of non-existent criminal behaviours, such as blackmailing the Nation of Sweden. This measure was one among the variety of articles and aired programs aiming to discredit WikiLeaks and presenting Sweden under an attack from "Sweden's Number One Enemy" Julian Assange, as he has previously been named in Sweden's mainstream media both by the pro-government press and the "opposition" press. During a recent radio debate in which Professors blogg was invited to meet Expressen's editor-in-chief's opinions (Radio1, aired 3 March 2012) on WikiLeaks, Mr Thomas Mattsson dismissed any explanation pointing to a coordinated media campaign as nonsense. During the acid polemic which have ensued between WikiLeals and Expressen, the tabloid has been signalled as a megaphone of the Moderate Party - or going "hand-in-hand" - as Julian Assange recently indicated. The Swedish military collaboration with the Saudi Arabia dictatorship commenced under the previous social democratic government of the pro-Bush PM Göran Persson and his Justice Minister Thomas Bodström -- the main partner in the firm Bordström & Borgström which instigated the reopening of a process against the WikiLeaks founder. The Swedish mainstream media - State or corporate owned - will in these days give the impression that they, or the political establishment, is "reacting" to the disclosures. For instance, it is announced that the Green Party have reported Minister Tolgfors to the Parliament's Constitutional Committee. It will not happen a thing. Professors blogg can absolutely promise: Nothing it will happen at the end, unfortunately. Another way from the Swedish political establishment of faking a reaction is calling for a modification of the current legislation on arms/weaponry export. With this they let people "understand" that in the agreements with Saudi Arabia dictatorship were nothing illegal, that the law permitted such things even if "one could think it would be inappropriate". Such is the posture for example of Folkpartiet (a party of the government coalition), in declarations made today by chairman Jan Björklund. According to TV News (19.00) The chairman of such Constitutional Committee has already declared that the above it will not be considered in any case before year 2013. This because their agenda is fully booked for this year! In October 2011, the Swedish monarch bestowed his Saudi Arabia counterpart with a Swedish medal, the Wolf Bronze Award. This caused just a minor "storm bubble" in Sweden, almost unnoticed in the country but known abroad thanks to a reportage by The Local of 4 October 2011. This morning, the Radio Program Ekot – one of Sweden’s eldest – informed that the Swedish agency has been helping to plan such factory since 2007. That was a time in which the Swedish government, politicians, and the official press (read Swedish mainstream media) arduously agitated the “Neutrality” of Sweden. In spite of the documentation gathered by Ekot, officlas at the FOI still denies. And PM Reinfeldt appeals to a "secrecy matter", according to SvD. 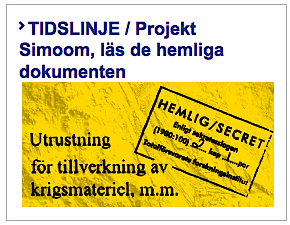 While the official representing FOI, the Swedish Defence Research Agency – subordinated to the Ministry of Defence of “Neutral” Sweden, slandered WikiLeaks in the Swedish Sate television SvT on the 29 of February, The said SvT accused the organization founded by Julian Assange of - "According to WikiLeaks" - being organizing a campaign to discredit Sweden!